Constructive criticism helps us improve our individual communication products as well as our overall communication skills. If you plan to publish your video, either on a video-sharing site or as online supplementary material with a journal article, it’s a good idea to first get some feedback from potential viewers. Many of my science videos have gone through a formal peer review process, which involved comments from at least two colleagues, followed by review and approval by officials at several levels in my agency. You don’t have to go to this extreme, and, in any case, there are few mechanisms currently in existence that offer peer review of videos comparable to that of scientific journals. And, not all videos require peer review. You certainly don’t need a formal, collegial review of a video tour of your laboratory facilities to put on your website. However, you do want to know if your tour video is likely to attract prospective students and postdocs, for example. In that case, you might want to show it to a few students and ask them what they think. If their response is not what you expected, then you’ve gotten some useful feedback and perhaps need to rethink your video. Similarly, if your video is to be submitted to an online journal, it would be wise to show it to a couple of colleagues first. Or, if your target audience is the general public or some other non-specialist group, you might want to ask members of that group to preview your video before you publish it. Your goal is to determine if the content is understandable and interesting to your target audience. You (and your colleagues) probably are not the best judges of whether your video is engaging and whether the content is presented in a way that is easily understood by a non-specialist. The only way to determine this is to solicit feedback from your target audience. If after viewing your video, a target viewer expresses confusion over a key concept, then you know you’ve still got some work to do. Or, your student reviewer might say, “I really liked the part with the students collecting samples; I wish there had been more of that instead of the scientist talking about the carbon cycle.” Again, this would be very good feedback. In response, you might want to change your video by intercutting more footage of students working while the scientist’s voice is heard explaining how what they are doing relates to the carbon cycle. That would be an easy editing job, and the change will likely make your video more appealing to its target audience. However, I find that some of my colleagues are uncertain about how to review a science video and, consequently, fail to provide useful feedback. They either try to review it like a journal article or want me to change it to something that will not appeal to my target audience (usually by adding citations or data). Because this is such a new area, there is virtually no guidance available to aid reviews of science videos. To help potential reviewers out, I’ve compiled a list of questions to help guide the review of a science video. 1. Are all visual media (e.g., video footage, photographs, animations) of high quality (i.e., in focus, well-composed)? 2. Is the audio clear throughout and not obscured by extraneous noises? 3. Is all text legible and easily read within the timeframe provided? 4. Are all graphs, diagrams, or other illustrations of good resolution (not pixelated) and clearly labeled? 5. Are interviews (with scientists, students, others) professionally done? 6. If music or sound effects are used, are they appropriate and effective? 7. Are there any additional media that might improve the video? 8. Are sources of all external media (e.g, historical footage/images, music) clearly acknowledged? 9. Are proper safety procedures followed throughout the video (e.g., are laboratory personnel wearing lab coats and appropriate footwear, safety glasses, etc.)? 10. Does the video address an important issue or interesting topic or provide useful instruction? 11. Does the title of the video accurately reflect the content? 12. Is the scientific content accurate and appropriately attributed? 13. Is the length of the video appropriate? If not, where might it be cut or expanded? 14. Does the video clearly identify a central question, objective, or concept? 15. Does the video capture the viewer’s attention early and hold it throughout? 16. Does the video have a clear storyline or logical path that is easy for the viewer to follow? 17. Will the video be understood by the target audience? If not, which parts need to be revised? 18. If for a non-specialist audience, is scientific jargon minimized and are all essential technical terms defined or explained? 19. Does the video achieve its stated or implied purpose (inform, instruct, engage)? 20. Do you have any other suggestions for improvement? Many of us give talks at conferences and seminars, but these presentations are only seen once by a limited audience. What if you could record your presentations so that other people can easily access and view them? Having a recorded presentation (aka screencast) allows you to post it as a video on your website or send it to someone interested in your topic. 1. A slideshow created with PowerPoint or a similar application. Compile your presentation as you normally would for a talk and write out the script so that you can deliver your talk smoothly. You may need to practice beforehand so that it does not sound like you are reading. 2. Some type of screen capture software such as Quicktime Pro (Mac), Screenflow (Mac), or Camtasia Studio (PC or Mac) to record your computer screen, your voice, and your image (if you wish). In my tutorial, I will be using Screenflow, which is for the Mac, but the principle is the same for all these applications. These all record whatever is visible on your computer screen along with any audio. You can also record your own image with the built-in camera on your computer. Your image then can be inserted into a picture-in-picture window within your presentation so that the viewer sees you along with your slides. 3. A decent microphone to record the audio. The built-in microphones on most computers are not that good. The audio quality of your presentation will be greatly improved if you use a good external microphone (see previous post). You also need a way to share your presentation once you’ve finished. The simplest way is to upload your finished file to a video-sharing site such as YouTube or Vimeo (see this post that explains what to consider in making this decision). If you are concerned about copyright, then be sure to include a watermark on your video file (or on your slides). Once published, you can take the embed code for your video and insert it into your website or send the link to someone (instead of the file, which likely will be too large to email). This is a great way to create a permanent record of your oral presentations. You can also create lessons to augment a course you are teaching or record class lectures for students to review as many times as they wish. There are lots of possibilities. Virtually anything that you can show on your computer screen can be captured this way and published as a video. Are you interested in learning more techniques like this? 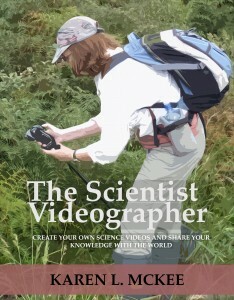 If so, check out The Scientist Videographer eBook, which is an electronic guidebook packed with information, tips, and tutorials and designed for the 21st century scientist, teacher, and student. Available in iTunes Store (fully interactive version for iPad, iPhone, & Mac), Smashwords (text version), and Amazon Kindle (text version). The success of your video will depend in part on good audio, which will require a decent microphone. You will need a good microphone during filming with a video camera as well as for doing voiceovers during editing. Which microphone you need and can afford will, of course, vary with your situation. Although there are many microphones that provide excellent audio quality, these are often quite expensive and may be out of reach for students and scientists with limited budgets. If so, there are some inexpensive options that will improve your audio, which I will emphasize here. In this video report, I demonstrate a few ways to improve the quality of your audio without breaking the bank. Most camcorders and other cameras that shoot video have built-in microphones that will work fairly well–as long as the speaker is close enough to the camera, and there is not a lot of background noise. Many of my videos were filmed using the built-in microphone on the camcorder or digital camera. This approach works fine when the speaker is stationary and speaking directly to the camera from no more than a few feet away. If the speaker is moving around or standing a distance from the camera, however, then it’s best to use some type of external microphone to boost the quality of the audio. The lavalier or lapel microphone is likely to be what the scientist videographer will find most useful. These are tiny microphones that clip onto the lapel of the person speaking and are connected via cable or wirelessly to the camera or a separate recording device. Unfortunately, not all video cameras come with receptacles for microphone jacks. One of my favorite point-and-shoot cameras, which shoots outstanding HD video, has no option for attaching an external microphone. My solution is to use my iPhone as an audio recording device and an external microphone with a jack designed to work with the headphone receptacle. The other situation requiring a good microphone is when doing voiceovers for your video. If you rely on the microphone on your computer or an inexpensive external microphone, your voice will likely sound “tinny”, and the overall quality of the audio will be noticeably poorer. I invested in a studio-quality microphone with a USB cable to connect to my computer. The better microphone has made a huge difference in the quality of my videos.